The Fulbright Program is the flagship foreign exchange program of the United States of America (USA) and the largest educational program in the world. Founded in 1949, the program aims to increase global collaboration and cultural understanding by immersing selected researchers in their chosen field of study, internationally. Fulbright Scholars, Professor Bradford Worrall from the University of Virginia, Associate Professor Stefan Paula from Purdue University and Professor Seth Rasmussen from North Dakota State University will collaborate with University of Newcastle researchers over the coming months to create tangible impact in their fields of discipline. The Fulbright Distinguished Chair in Health scholarship recipient, Professor Bradford Worrall, is a medical researcher with a focus on the study of genetics to help understand risk in stroke and other cerebrovascular diseases. During his time at Newcastle, Professor Worrall will work with Professor John Attia, Director of the Hunter Medical Research Institute’s Clinical Research and Statistical Support Unit, to refine and improve the tools to distinguish types of strokes. Professor Stefan Paula, an Associate Professor of Practice in the Department of Chemistry at Purdue University, works in the area of computer-assisted drug discovery. As a recipient of the Fulbright Senior Scholarship, Professor Paula will work collaboratively with University of Newcastle researcher, Professor Adam McCluskey on a joint project to develop new drugs to treat breast cancer, bridging a new, long-term collaboration between their two research teams. With a keen interest in organic electronics, Professor Seth Rasmussen will study the application of new plastics to organic solar cells and near-infrared photodetectors at Newcastle’s Centre for Organic Electronics with Professor Paul Dastoor. Professor Rasmussen is the recipient of a Fulbright Senior Scholarship and through his work at the University of Newcastle hopes to develop new beneficial technologies for society. Wollotuka Institute Director Mrs Leah Armstrong, Professor John Maynard, UON Resident Artist Ms Nicole Chaffey, Senior Deputy Vice Chancellor and Vice President - Global Engagement and Partnerships Professor Kevin Hall, Aunty Sandra Griffin (Awabakal), Senior Scholar North Dakota State University Professor Seth Rasmussen, Vice-Chancellor Professor Caroline McMillen, Ms Tammy Small, Senior Scholar Purdue University Professor Stefan Paula, Distinguished Chair University of Virginia School of Medicine Professor Bradford Burke Worrall. 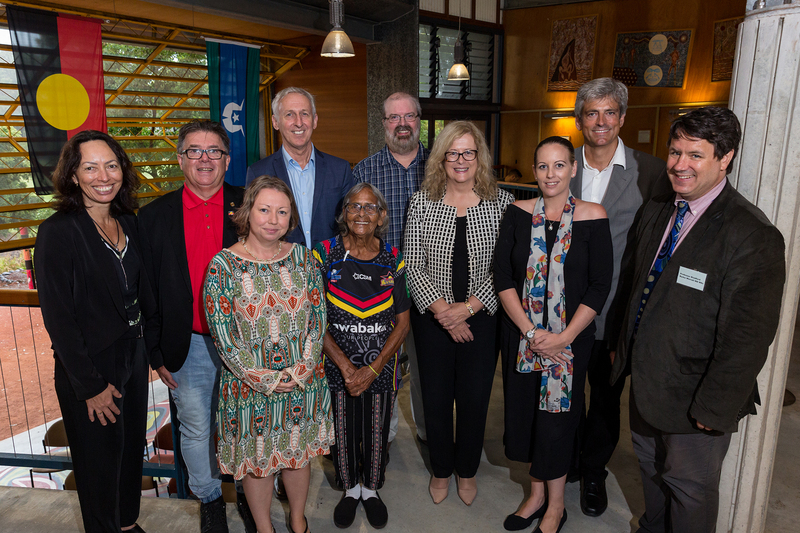 University of Newcastle Senior Deputy Vice Chancellor and Vice President - Global Engagement and Partnerships, Professor Kevin Hall, said it was a milestone achievement for the University to be hosting three American Fulbright Scholars. “This is the first time the University has hosted a Fulbright Scholar under a partnership agreement and we are honoured to welcome three Scholars who each demonstrate a high degree of excellence in their field. We look forward to exploring promising research and strengthening global impact through collaboration with Professor Worrall, Professor Paula and Professor Rasmussen. “As a participant in one of the most prestigious international research exchange programs in the world, the University of Newcastle is in a fortunate position to help facilitate global collaboration and foster the growth of research,” Professor Hall said. Two University of Newcastle researchers, Associate Professor Jed Duff and Dr Andrew Gardner, have also been awarded Fulbright scholarships in 2018 and will visit the USA to further their research in the field of health. Researching in conjunction with the Hunter Medical Research Institute (HMRI*) Associate Professor Jed Duff and Dr Andrew Gardner will investigate models in nursing practice and sport related concussion respectively that could be translated in an Australian context with great impact. The University welcomed the American Fulbright Scholars at a ceremony at Callaghan campus on Wednesday 21 March.